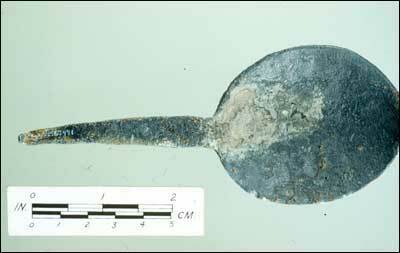 Pewter spoon of low quality was lost at the site in the mid-17th century. 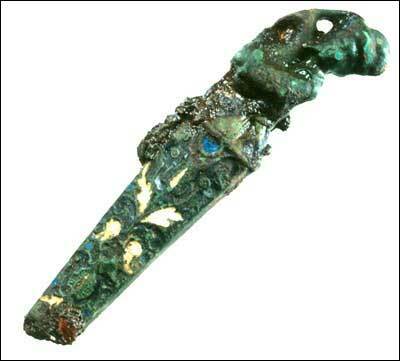 About 9 cm long, the hilt with enamel work and the cast figure of a piper, dates from the early 17th century and is probably of Dutch origin. The intricate design was scratched through the white slip to expose the red body below. 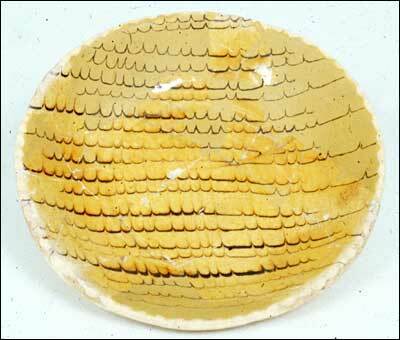 The inside was then covered with a clear lead glaze. Found in the privy, it probably dates from 1673. 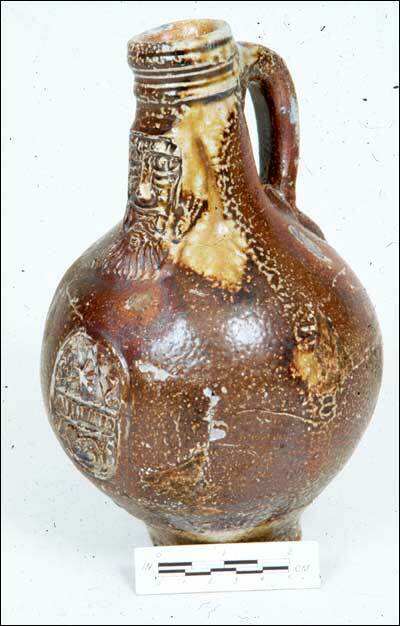 "Bellarmine" or "Bartmann" stoneware jug, made in the Frechen region of Germany and used to hold distilled spirits. It was broken and discarded about the time of the Dutch raid in 1673. Large North Devon milk pan, used to separate cream from milk. It was found adjacent to the cowhouse on the waterfront and dates from the second half of the 17th century. 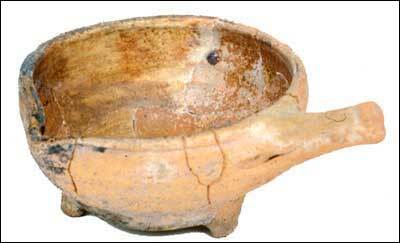 Small North Devon "pipkin" or cooking pot, has three small legs on the base to hold the vessel upright on, or near, the cooking fire. It dates from the mid-17th century. 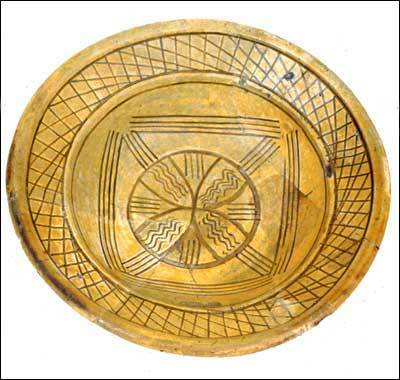 Approximately 18 cm in diameter this combed slipware plate was found in a house built in the third quarter of the century and burned by the French in 1696. 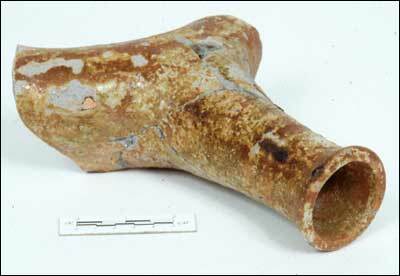 Combination bedpan/urinal, made in North Devon and found in a house built after 1650 and burned by French forces in 1696. 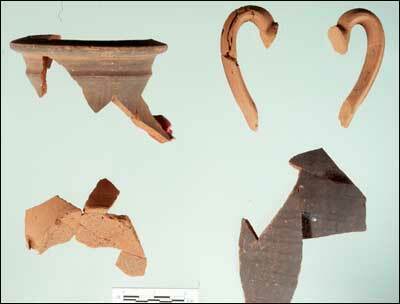 Fragments of a two-handled storage jar, found in the lowest layers at Ferryland. 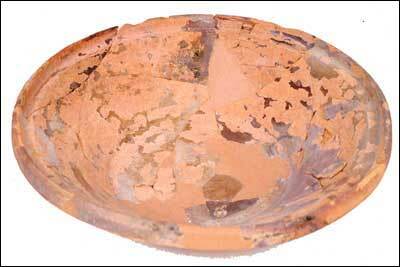 It is of Portuguese origin and known as "Merida-ware." It was in the same layer as the remains of Beothuk Indian hearths and was broken early in the 1500s. 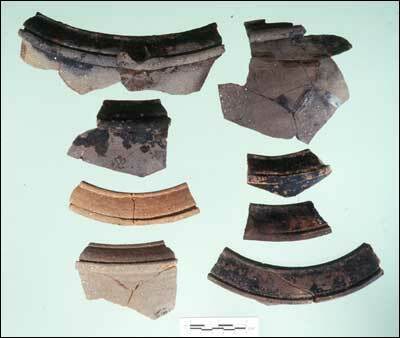 Rim sherds of cooking pots with peculiar inverted rims were found in a layer dating from the early 1500s. They are believed to have been made in Normandy or Brittany.